Madison Heights James Hardie Siding | Madison Heights James Hardie | Madison Heights James Hardy Siding | Madison Heights James Hardie Fiber Cement Siding | Madison Heights Fiber Cement SidingMcGlinch & Sons CO.
At McGlinch & Sons we know that you don’t want your house to get damaged due to the many weather changes that Michigan has to offer. With all the unwanted humidity, rain and snow that can be very damaging to your home and the moisture can eventually lead to unwanted decay. If you happened to have wood or vinyl siding that will not hold up for long, which is why you need to invest in our James Hardie Siding products that will bring a beautiful look to your home and protect it! McGlinch & Sons wants all its customers to be satisfied with our James Hardie Fiber Cement Siding. We serve customers all throughout the Greater Detroit Metropolitan Area and Southern Michigan area. Our customers know that when they invest in the James Hardie products that they will get exactly what they desire. The people of Madison Heights have been using our services ever since we opened our doors in 1917 and love our James Hardie Siding products! Being that James Hardie Siding is a much better product than vinyl, fuller, non-flammable, fade and weather resistant, it is recognized for out doing both wood and vinyl siding. 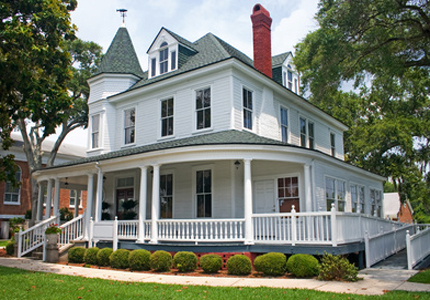 James Hardie Siding never needs to be repainted, mainly because it keeps away moisture. It will not rot from snow, rain or any humidity. After James Hardie Siding withstood against Hurricane Sandy on the Eastern Seaboard we know that it can handle any kind of weather that Michigan has to endure. The James Hardie Fiber Cement Siding can protect homes and buildings from wildfire, hurricanes, windstorms, and tornados. So if you need additionally information about our James Hardie Siding products, give McGlinch & Sons a call right now at: (248) 987-6300. We’re looking forward to hearing from you!